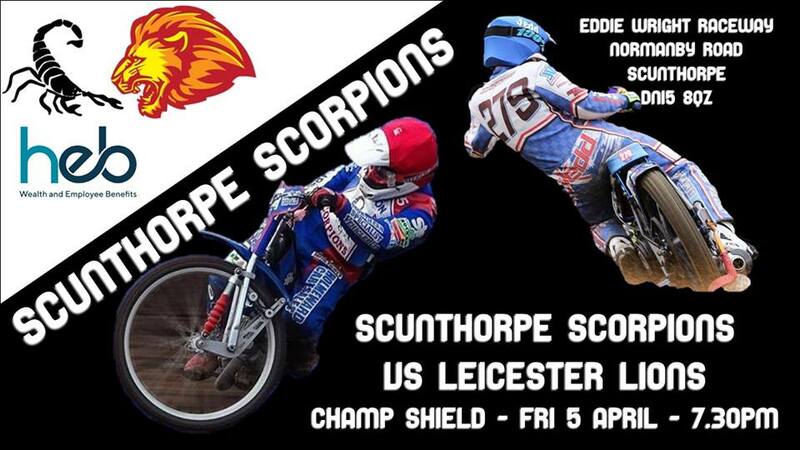 HEB Scunthorpe Scorpions commence their home fixtures with a tough test against Leicester Lions in the Championship Shield at the Eddie Wright Raceway on Friday (April 5th) at 7.30pm. Scorpions took to the track for the first time in competitive action in 2019 at Sheffield on Sunday, and pushed Tigers close, before going down 41-49, with Australian Jake Allen top scoring on 13 points. Leicester have rejoined the Championship in 2019, after five seasons in the top flight. Scunthorpe promoter Rob Godfrey says: “We’re starting our home meetings with a very attractive fixture. “Leicester bring a strong side to the Eddie Wright Raceway, led by seven-times British Champion Scott Nicholls, and they also have a host of ex-Scorpions, including a very familiar face in Ryan Douglas, who returns to Britain this year after a season at home in Australia because of visa issues. Godfrey says he was very encouraged by the performance by Scorpions at Sheffield. “I’ll be honest about it – I thought we might come away from Sheffield with a heavy defeat. “The only reason I thought that was because it was our first match and we were lacking race fitness, while the Sheffield riders had already had a meeting in the Steel City Championship to get themselves warmed up and back into the swing of things. “So, I was pleasantly surprised by how we performed and, in the end, I was gutted we didn’t get a point because I thought we deserved one. “Leicester will provide a hard match, but if we can carry on where we left off at Sheffield, I see no reason why we can’t see them off and take the points. HEB Scunthorpe Scorpions: 1. Josh Auty, 2. Stefan Nielsen, 3. Jason Garrity (captain), 4. Jedd List, 5. Jake Allen, 6. Ryan Kinsley, 7. Josh Bailey. Leicester Lions: 1. Scott Nicholls, 2. Ellis Perks, 3. Josh Bates, 4. Ryan Douglas, 5. Richie Worrall, 6. Jack Thomas, 7. Connor Mountain.